"One who has the courage of living weak - of vulnerable dependence on Adonai - evokes mercy from the Father for that very human weakness." Every believer is called to a great destiny in communion with God... but the way to find it may not be what you think. What is the secret to fullness? Do you feel disconnected from the world around you, alone even in a crowd, wondering why every joy is fleeting? Do you struggle to find contentment in your life even though you know you’re blessed? Are you tired of joy that is only temporary? Most people think that fulfillment comes with acquisition: more money, more power, more intimacy, more approval, more achievements. Yet all too often, the more we get, the less content we find ourselves and the emptier our lives feel. And you do not realize and understand that you are wretched, pitiable, poor, blind and naked. “The funny thing is, when you are wretched, everybody knows it but you! When you are not true and not real, everybody knows it but you. And God wants you to be covered; He wants us to be covered, but we have to be willing to need covering. “And if we cover ourselves with a role, a mask, a pretense, or an image, it’s usually completely evident to people, like the old fable of the emperor with no clothes. The tailor came and convinced the emperor that he was making these gorgeous clothes, when he wasn’t making anything. 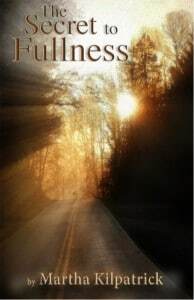 In The Secret to Fullness, Martha Kilpatrick shows us where to find the narrow path to fullness. Every believer is called to a great destiny in communion with God…but the way to long-lasting contentment and true satisfaction may not be what you think. The Secret to Fullness is only available in digital format. Blessed (happy, to be envied, and spiritually prosperous – with life-joy and satisfaction in God’s favor and salvation, regardless of their outward conditions) are the poor in spirit (the humble who rate themselves insignificant), for theirs is the kingdom of heaven! This is so real. The word “poor” there means beggar. It doesn’t mean that you have a little; it means you have nothing and all you have must be given to you. And it seemed like such a poor answer to such a grand question, but later I thought, “No, it is complete desperation.” When I first came to the Lord, I was in absolute destitution. It wasn’t that I believed He was good that caused me to surrender. I needed Him to be God so badly that He was the only answer for me! or I was doomed and so was everybody in the world. Need is the place where you receive God’s fullness. That’s where He comes into the absolute emptiness of your capacity to do anything worthwhile. However, some of the neediest people are unwilling to need. They are so proud that they will not need. We were created to need God, and we were created to need each other. God said, “It is not good for the man to be alone” (Gen. 2:18). We need each other. Men need women, women as friends, if not wives. And women need men. Our humanity is designed to need, and then to find all supply in God. If we are too proud to live in want, we will be without God. We will be without the tremendous invasion of His life into our innermost, deepest, darkest being. Over the years I have seen the people who will not have need, who will not endure the humiliation of being in need. Eventually, they live in isolation, and for some there is a certain madness that comes when you live in isolation and hear only yourself, when you refuse to be humble enough to truly need any other person. So if you want to be the only one and the leader and the best, you’re going to do it alone. Not only alone from other human beings, but you will be isolated from God. There are dark regions of our human soul that we will discover if we will be honest. And we have to let the light of reality come into those areas. But if we will not admit those deeper, wretched levels of malice, selfishness and envy, then we refuse God’s entrance and our own cleansing. If we won’t admit it to God, and when appropriate to each other, we will not know His healing. Therefore, confess your sins one to another…so that you may be healed (of that sin). The door to the kingdom is poverty of soul and spirit; poverty of life is the door to the kingdom. If you open that door to Jesus, then He opens to you the door of the kingdom. He comes into that painful room inside our human helplessness. He comes to fill and recreate our very being from deep within. Jesus put on frail humanity. He, the Son of God, went into our dilemma when we won’t even live it! That is why so few really possess the fullness of God. I am whatever anyone is because my nature is the same. And yet when God wants to bring you to that level of humility, so that He can be everything to you, you fall madly in love with Him because He is so sufficient. The wonder is: He comes in and accepts you. He comes in! She does not know that it was I who gave her the grain, the new wine and the oil… Therefore, I will take back My grain at harvest time, and My new wine in its season. I will also take away My wool and My flax, given to cover her nakedness…and no one will rescue her out of My hand. Do you see God’s way with us? He is creating need for Gomer, so that He can have her. He loves her. He has to remove her sustenance, her false securities, her selling of herself to get her needs met. You are driven by your needs; you do what you do out of need. Gomer thought she was earning her provision. So if you will be in your rotten, feeble, selfish self – and in the lowest place that you have found in you open the door – then He is there to cover you with grace and to clothe you because He has stripped you down to the bone. That’s why He does it, saints! He wants to reduce us to need so that He can richly supply. We will not receive the fullness of His grace unless we need it. Jesus experienced our humanity. It just wrecks me that He really lived in this frail futility. He never left that human weakness. He simply lived receiving ALL from the Father. Christ lived in complete dependence on God. He was the only human being that, every second of His life, accepted His need of the Father. He never entered the effort to “be or do, or have.” He never went to independence. He lived only in raw need of God. He said, “I can do nothing on My own initiative” (John 5:30). He didn’t attempt the humanly impossible. I am awed that we have a high priest who “knows our weakness” and the struggles of it (Heb. 4:15). He embraced humanity’s weakness and the Father filled Him with power that was divine. Furthermore, He was not capturable. The scripture says He trusted Himself to no man (John 2:24). Why? He did not impose His need on people. He looked only to God for everything. Jesus wanted disciples to whom He could reveal the Father. He needed to do the will of God, but He had food to eat that they knew not. His food was to do the will of God. His need was to obey. And that is our need, too (John 4:34). Our need is to receive His fullness, so that we can give – out of our wretched person that is no better than anybody, and no worse than anybody. Humbled humanity has mercy for all humanity. Jesus never went where God didn’t send Him; He remained inside human limitation and God filled Him in that place.